Why is Donald Trump's tax plan ridiculed but the TPP deal gets a pass? Trade deals seem to enjoy a special status among economists. While they are happy to use the economic toolbox to take apart policy proposals on minimum wage, financial regulation or almost anything else, for some reason they don't like to use standard economic tools when it comes to the impact of trade deals like the Trans-Pacific Partnership (TPP). There was no shortage of economists who were prepared to ridicule Donald Trump's claim that his tax cut proposal would lead to 6% annual GDP growth. But where are the economists who will ridicule the Obama administration's claims that the this new trade deal will lead to more rapid growth? There is an argument that lower trade barriers increase growth, but this story doesn't really apply in this case. The problem is that most of the barriers between the countries in the new pact have already been removed. The agreement will not do much to lower barriers to trade between the US and Canada since NAFTA already eliminated most barriers. We currently have trade deals with six of the 11 TPP countries. The existing tariff barriers with Japan and New Zealand are already low. Reducing barriers with Vietnam might have some impact, but it is not that large an economy and it is located on the other side of the planet. 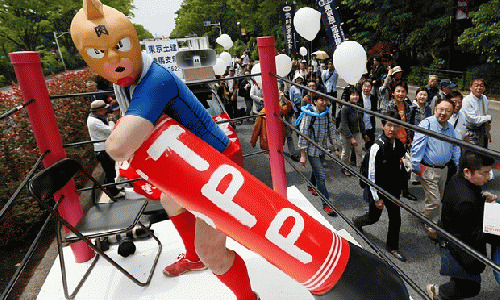 This is why efforts to analyze the impact of the TPP on growth have found little or no effect. An analysis by the United States Department of Agriculture found the impact would be negligible. An analysis by the Peterson Institute found that the cumulative gains after 12 years, when most of the trade deal's impact will have been seen, were just 0.07%. A more recent study upped this to 0.4%. The most optimistic of these estimates implies a boost to the annual growth rate of 0.03% points. If growth would have averaged 2.20% over the next decade without the TPP, the optimistic projections show growth averaging 2.23% annually due to the trade deal. This projection is optimistic not only because it is the highest number available, it is optimistic because it doesn't take account of the parts of the deal that are likely to slow growth. Specifically, the deal will lead to stronger patent and copyright protections, which will raise the price of the protected products, most notably prescription drugs. The United States currently spends $400bn a year on prescription drugs, or 2.2% of GDP. Tariff on most products are typically in the range of 5-10%. Patent protection can raise the price of a drug a hundredfold, the equivalent of a 10,000% tariff. Patent monopolies are the reason that some drugs cost tens or even hundreds of thousands of dollars a year. Without patent protection, the overwhelming majority of drugs would be available at $10-$20 a prescription. In addition to jeopardizing people's health and lives, the higher prices we will pay for drugs due to the new agreement will also slow the economy. The money paid for drugs is money pulled out of people's pockets. For some reason, economists don't like to include the drag on growth from patent monopolies when calculating the impact of the TPP. But this drag on growth does not disappear just because economists don't want to talk about it. Whatever increase we see in drug prices in the US, the impact of stronger protection on growth, as well as on people's health, is likely to be far greater in the other pacific rim countries. In addition to the hit to public health and economic growth from stronger patent protection, the trade deal raises a long list of regulatory issues. Top on this list is the investor-state dispute settlement (ISDS) mechanism, essentially an extra-judicial legal system which is created exclusively for the benefit of foreign investors. The scope of the mechanism was supposedly lessened in response to public opposition, but we will only know its status for certain when the text is made public. The agreement excluded one of the most important trade issues facing the United States: setting currency values. The United States has a large trade deficit primarily because several countries, including some in the TPP, have bought huge amounts of dollars in order to prop up the dollar against their currencies. This has the same effect in promoting their exports and limiting their imports as if they had a subsidy on exports and a tariff on imports. The Obama administration opted not to include currency values in the deal. The loss of good-paying manufacturing jobs due to the trade deficit is apparently not a priority. Yet, well-connected companies like GE produce much of their output overseas and are happy to see the dollar remain over-valued. The lack of interest in currency rules says pretty much everything we need to know about the TPP. It was a deal done for corporate interests over the heads of the American people. Now we get to see how our representatives in Congress will respond on the final vote, in an election year.